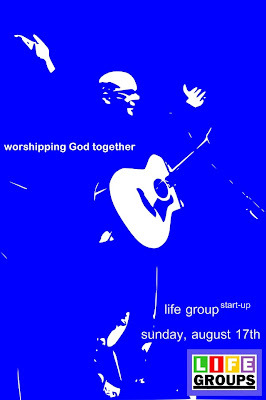 We are having a Life Group (our small groups ministry) kick off event to help connect those who aren't in a group already and as well launch our Life Groups with momentum right at the beginning of the ministry year. There are three ads, all built around our "3 Loves" of Big Creek. Love God. Love Each Other. Love the Community. And I use PaintDotNet program which is a great open source, free graphics and photo editing tool.